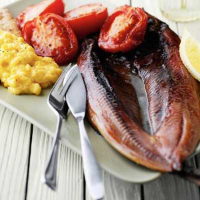 Great weekend breakfast Craster kippers are oak-smoked for natural colour and flavour. Place 3 kippers in a heatproof dish, cover with boiling water and leave for 10 minutes or until fully cooked. Drain and keep warm. Melt 25g butter in a non-stick pan, add a small leek, finely sliced, and cook gently for 3 minutes. Beat 6 medium eggs with 100ml milk and add to pan to lightly scramble. Split and toast 4 Waitrose Wholemeal Muffins, butter and spoon on the egg. Break up kippers and pile on top. Serve piping hot, topped with chopped parsley.